Time to privatize the bloated Liquor Control Board of Ontario! The Liquor Control Board of Ontario, taxpayer subsidized and government monopolized was Ontario’s answer to prohibition. One of the world’s largest sellers of alcoholic beverages the LCBO proudly boasts it’s one of the only crown corporations to turn a profit! How exactly could it not? Known for their high prices and poor hours, the LCBO is a laughing stock to Western Canadians where privatization and countless small beer vendors are the norm. While Canada is subject to the Excise Act which contributes to the cost of beverages the vast majority of hidden liquor tax customers pay is provincial. With brands selling in Ontario for up to 60% more than in New York State. 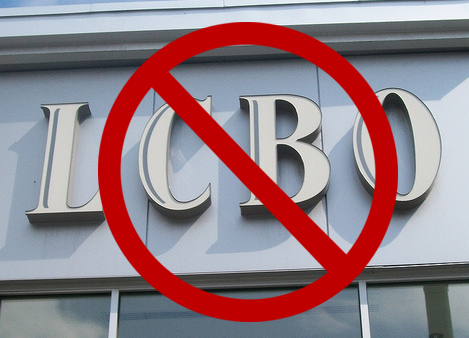 Using a legally sanctioned price fixing mechanism to guarantee profits and discourage price competition the LCBO enforces minimum selling prices on all their products. The LCBO returns around $1.2 billion to the Ontario government which is a pathetically poor amount considering the large market share it retains. Due to the inevitable red tape and bureaucracy ripe in the public sector, this is not a surprise. In an effort to discourage any complaints of government-granted monopolistic hematophagy the province grants two small private companies to “compete”. Yet the Beer Store keeps the same LCBO hours and policies, while the Wine Rack by a fluke of the Liquor Licence Act of Ontario is allowed to sell only Ontario wines from a small coalition of independent vineyards. Private liquor stores and/or motor hotel vendors are legal in British Columbia, Alberta, Saskatchewan, and Manitoba. They are legal in most jurisdictions on the face of the planet. Yet according to the Ontario government if private beverage resellers open up, and people are allowed to buy some drinks a single tick after 5:00 pm on a Sunday all hell will brake lose. Kids will be knocking back a mickey on the street, while drunk drivers run over elderly ladies and bare knuckle boxing brawls brake out in every park. Heck, Al Capone himself will rise from the grave and start bootlegging tax-free bathtub gin. The entire province will go blind with alcohol poisoning! In order to avoid this disaster up until the early 1960’s the LCBO licensed drinkers the same way that driving is licensed. People who wanted to drink had to fill in several application forms and were issued individually numbered liquor permits that kept a record of the individual’s purchase history, just to buy some suds. Even past 1975 the LCBO conducted its own massive spying operations on customers employing an army of under cover investigators that clandestinely visited customer’s homes, workplaces, banks, neighbours and even churches to decide if an adult was worthy enough sip a sherry. Not only was this a blatant violation of privacy, but also a huge waste of taxpayer dollars to embarrass the public into temperance. Hundreds of thousands of individuals were blacklisted and banned from every retailer in the province, in some cases just because their investigation showed a customer bounced the rent cheque at their bank. The main benefit of selling the LCBO would be sixteen billion dollars that would be the immediate windfall from the sale. And even with this one-time profit, the province could actually earn more money by dismantling the high-margin retail stores while keeping the lucrative wholesale business. The Alberta government actually showed more profit by privatizing their stores while acting as the middle man between the importers/manufactures and the stores. Here comes the Ontario Public Service Employees Union, as always offering moronic excuses of why privatization is such a filthy word that should only be spoken of in disgust. Last summer they threatened to make this a dry province unless their demands were met. Collecting the dues of 6,700 LCBO employees the union decried their contact, wanting more wages, more hours, more benefits and a signing bonus. No one makes $50,000 a year putting a bottle in a flimsy paper bag full time, except at your local LCBO. While the very few full time employees at the LCBO struck it rich, the part time contract workers who make up the rank and file had nothing to cheer about. The union clamed victory, taxing the backs of “casual employees” on every paycheque. Working poor who got little out of the deal, yet hey at least they no longer have to wear ties to work. Well la-di-frickin-da! In the real world, companies make a profit to keep afloat while struggling to stay alive. Private sector employees can not afford to strike. They’re happy just to be employed. The LCBO has phased out its plastic shopping bags, as part of its efforts to become a greener organization. Now handle-less LCBO paper bags make it next to impossible to carry heavy purchases, and melt in the rain. Countless oceans of the angels share made its way into the gutter thanks to this stupid move. In an effort to pretend to be green the LCBO does not want any plastic bags in landfills, ignoring the fact people use them to store garbage that would otherwise fly in the wind – and most cities accept them with recycling anyway. Thus forcing spontaneous purchases by pedestrians to buy a one dollar bag each time they shop at the LCBO. In September 2006, the Government of Ontario announced another stupid green scam for the LCBO. The government program, which was forced on all alcohol containers in the province by charging customers a bottle deposit tax of ten to twenty cents a can or bottle and can only be refunded at Beer Store outlets. This program has been highly criticized by members of the public and employees of The Beer Store. Beer Stores were seeing upwards of 50,000 LCBO containers per week while the unprofitable nature of the program forced wage cuts and staff reductions across Ontario’s private beer distributor. In true to the LCBO’s stupidity this forced tax actually COSTS the province $15 million per year. Don’t have the transportation to take your empties back? You may like to know your friendly local binner is breaking the Residential Collection By-Law 844 by scavenging your blue bin.